Before, during, and after NaNo, I binged-watched Season Two of Orphan Black, which was twister than Season One, with more mysteries revealed and more clones in on the action. 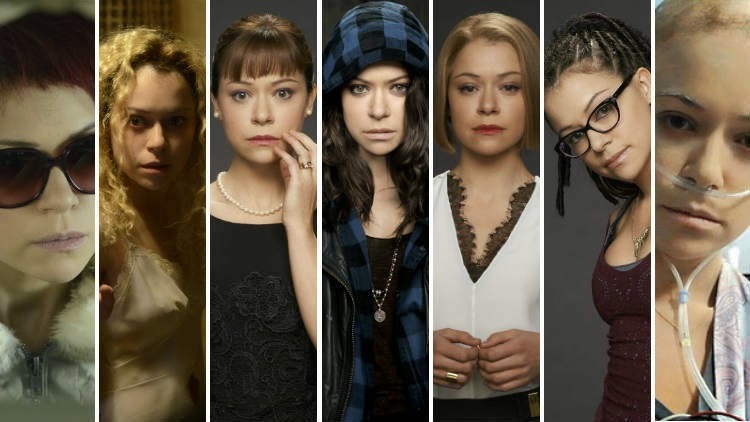 One of the things I love about Orphan Black is Tatiana Maslany's incredible performances. She plays all of the clones. All. Of. Them. And it's incredible because in scenes where there are two or three or four clones (four clone dance party, anyone? ), I don't think, "Oh, it's Tatiana Maslany acting opposite herself." I go, "Oh, it's Cosima talking to Sarah while Alison is doing something in the background." Each of the clones has a distinct personality, appearance, reactions, just as if they were really different people who had grown up in different environments with different beliefs, despite being played by the same actress. I think it's exciting to see so many different types of women portrayed in one show. It's certainly opened up my mind to different ways I can write my modern-day female characters. 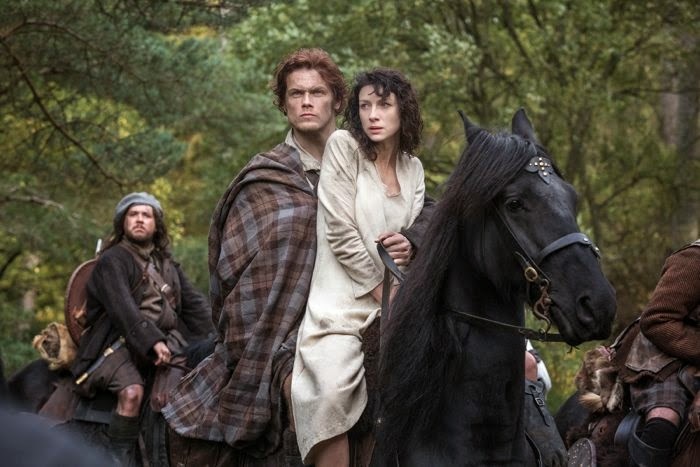 I also began reading the Outlander books by Diana Gabaldon because I so wanted to watch the TV show and because I'm a reader first and a television watcher third or fourth, I waited until I was done with the book before I began scouring around for the eight episodes that have aired of season one of Outlander. What a great show. Seriously. I love seeing anything 1940s on screen, so the 1940s stuff was great to see and then when Claire falls back into the 1740s...wow. Cool. Besides my wee literary crush on Jamie Fraser, Claire really is a great female protagonist, strong, intelligent, and adaptable, if occasionally a big mouth. The books are awesome, accessible historical fiction, deeply detailed, and the writing is detailed, entertaining, and just puts you there. 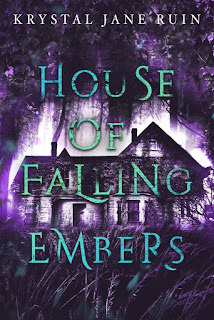 Watching an original TV show and reading five (so far) of an eight-book series and then watching eight episodes, I've picked up some writing tips, some characters ideas, and had a ball watching these productions. Which, considering how I felt about the recent fifth season of Downton Abbey (12 years on and everyone looks the same, including Maggie Smith...getting kind of unbelievable), is fantastic. And people say you learn nothing from TV. I have never heard of Orphan Black! But it looks really interesting. I'm so looking that up. My mind is mini blown already. I think you'd really like Orphan Black. If you have Netflix, get it on DVD. As for Outlander, Claire goes back to 1743 Scotland--just before the Jacobite Rebellion and the Highland culture basically gets wiped out in 1746. I've been hearing great things about Orphan Black! I wish I could watch it! It's only offered on Amazon Prime right? I read Outlander too! The end was well... definitely shocking to me. I'll have to check out the show soon! I saw Orphan Black by getting the DVDs through Netflix. Don't think they have it on Netflix streaming yet. The end of Outlander made me more sad than shocked, tbh. I could kind of see it coming *writer's hat* Being a recent reader, I'm not that attached to certain elements of the books which makes it easier for me to watch the show and just be all up in the show. It's really good! It can be interesting to see the differences between a book and the TV or film version. Oh, definitely. And because TV is a different medium, I feel like I can spot plot, character moment, and all those technical things easily...I tend to get lost in the story when I'm reading a book.